ISBN 0793546427. 8.5x11 inches. Edited by Steven Stolen & Richard Walters. 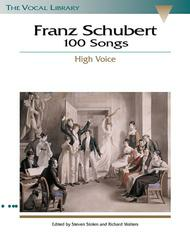 The most useful collection of Schubert songs available! Unlike international editions, these new songbooks contain only a few favorite songs from Die Schone Mullerin and Die Wintereisse, rather than the rarely-used entire song cycles; this leaves room for many more wonderful individual songs not normally found in Schubert collections. As in the other volumes in The Vocal Library, each song features introductory notes including information about the composition, the song's biographical context in Schubert's life, early performances and comments about poets. The contents for the High Voice and Low Voice editions are almost the same: the High Voice volume uniquely includes 'Der Hirt auf dem Felsen' (with removable clarinet part) and 'Auf dem Strom' (with removable horn part); the Low Voice volume uniquely includes 'Das Abendrot' and 'Romanze.' The cover is adorned with a charming 1821 watercolor depicting Schubert and friends at a summer gathering in Atzenbrugg. All songs have been newly edited and researched based on the most current historical material available. Love, beauty, loss, hope -- that the lyrics are in German does not diminish the poignancy of Schubert's songs. Excellent, clear copy, with full piano accompanyment. A very large part of the lovliness of these songs is the major part given to the piano. Literal (not metered) English translations.